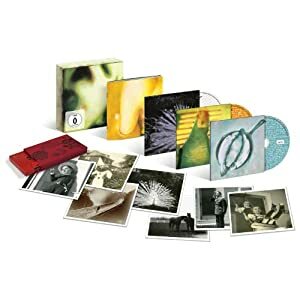 EMI Music's extensive reissue campaign honoring the legacy of THE SMASHING PUMPKINS continues July 17 in North America and July 16 internationally. That's when the iconic alternative band's third album PISCES ISCARIOT--1994's platinum-certified disc that reached #4 on the Billboard Top 200 albums chart--receives the fully remastered treatment for the first time. This follows last year's acclaimed reissues of the band's groundbreaking first two albums, Gish (1991) and Siamese Dream (1993). "A collection of odds and orphans from the dusky realms of Pumpkinland" is how PUMPKINS founding member BILLY CORGAN describes PISCES ISCARIOT in the liner notes penned by David Wild. "PISCES ISCARIOT was the little mix tape that went platinum," writes Wild. "This unlikely smash album that some came to mistake for the Pumpkins' third studio effort even yielded a hit single--another wonderfully odd moment in the landslide that was the intense early success story of Smashing Pumpkins." Featuring the band's take on the Fleetwood Mac/Stevie Nicks song "Landslide" which reached #3 on Modern Rock Tracks chart, PISCES ISCARIOT is being released in multiple configurations: Deluxe Physical Album--which comes with a live DVD and the first-ever PUMPKINS demo reproduced on cassette--Deluxe Digital, Standard Physical, Digital and 180G Vinyl. The bonus content and special features were curated from the band's archives by CORGAN, and have been painstakingly remastered for the first time from the original master tapes by Bob Ludwig. *See all track listings below. With the full support and guidance from THE SMASHING PUMPKINS--who've created one of the most acclaimed bodies of work in musical history, selling over 30 million albums--EMI's global catalog reissue campaign will last through 2013; it will encompass all the band's albums and B-sides from 1991-2000, with other release dates to be announced. The pivotal group's many hits defined the alternative music era and continue to resonate on modern rock radio, influencing a whole new generation. As THE SMASHING PUMPKINS get the fully remastered treatment via these reissues, the band is excited to be moving forward by creating new music. On June 19, the band released OCEANIA, via Martha's Music/EMI Label Services/Caroline Distribution. Marking THE SMASHING PUMPKINS' 7thstudio record, it is "an album within an album," part of their 44-song work-in-progress TEARGARDEN BY KALEIDYSCOPE. OCEANIA was recorded at the group's studio in Chicago with CORGAN's bandmates: guitarist JEFF SCHROEDER, drummer MIKE BYRNE and bassist/vocalist NICOLE FIORENTINO. THE SMASHING PUMPKINS have created one of the most acclaimed bodies of work in musical history having sold more than 30 million albums, and won multiple Grammy Awards in the process. Formed in Chicago in 1988, they released Gish, their influential and platinum debut in 1991, which was followed by albums including the nine-time platinum Mellon Collie And The Infinite Sadness and the four-time platinum Siamese Dream, as well as the platinum certified 1998 album Adore. The pivotal group's many hits defined the alternative music era and continue to resonate on modern rock radio, influencing a whole new generation. The PUMPKINS returned in 2007 with their acclaimed sixth album Zeitgeist. They have since remained on the cutting edge of music and technology with various online releases. In June 2012, the band released the album OCEANIA, via Martha's Music/EMI Label Services/Caroline Distribution. Marking THE SMASHING PUMPKINS' 7thstudio record, it is "an album within an album," part of their 44-song work-in-progress TEARGARDEN BY KALEIDYSCOPE.